I seriously doubt I had many of those “Best Ever!” days at Kelso High, where I was just learning the craft of teaching and generally experimenting and failing more often than succeeding. But every once in a while, something exciting would happen, and I missed the opportunity of sharing with a group of like-minded folks. One of the things I loved most about being an English Education major at Oregon State in the early ’80s was the collection of fun, quirky, and smart people in the program with me. Our classes and socializing were lively affairs, and I loved being able to talk about cool books, complicated ideas, what we were writing, what we were thinking–you know, those synergies that happen when we’re in an open and safe (but intellectually challenging) space. It was this kind of dynamic environment that I missed. I want to reiterate that I’m not trying to place any kind of blame here; I could have done something to start up a different kind of collegial interchange–but I didn’t, and so I continued to feel isolated in my five years at KHS. Fast forward eight years to the summer of 2000. I’d made my way through a PhD program and finished my second year as an English Education prof in the Cal State Chico English Department. I was gearing up to attend the Northern California Writing Project’s Summer Institute, under the direction of my friend and colleague Tom Fox. I was feeling more than a little trepidation, frankly. My first two years at Chico State had been a bit like Kelso High all over again, but multiplied by the stresses of trying publish in anticipation of tenure, hoping that my new colleagues wouldn’t discover that hiring me had been a huge mistake, etc., etc. I suspect that Tom recognized this, hence he _______ed me to the SI (while “browbeat” is undoubtedly too strong a verb, neither “suggest” nor “invite” convey the sense of urgency in his communique!). But as so many teachers before me, I found the Summer Institute to be a transformative experience. I was surrounded by smart, seasoned, and engaging professionals in the kind of environment I had craved when teaching high school. I felt that I had found colleagues with whom I could be honest about my teaching and scholarship (warts and all), colleagues with whom and from whom I could continue to learn and expand my teaching practices. It felt, in short, like finding myself at home. But I was still essentially clueless about what the Writing Project’s scope. Almost immediately after the Summer Institute (i.e., within a few weeks) I was a sort of participant-leader in a professional development institute with local high school teachers, and seeing how the Writing Project model worked outside the Summer Institute. Having been a high school teacher, I was well aware of the ways that professional development could go wrong, and so I was deeply impressed by the ways that the leadership team of Tom Fox, Lynn Jacobs, and Rochelle Ramay worked with the teachers. While this was not like the Summer Institute, the values of honoring teacher knowledge, adapting to local context needs, and inviting participants to be active members of a professional community around the effective teaching of reading and writing. To this day, we at the NCWP insist on identifying our work with teachers and schools as Professional Development and eschew the use of the term “training” (although we can’t seem to get any traction from schools or districts, for whom the efficiency of two syllables trumps our preferred eight). Since those humble beginnings, I have participated in and led many hundreds of hours of local site work, and none of it (well, hardly any!) has made me want to leave my professional home. And while the NCWP is and will remain that home, I’ve found that I have lots of safe havens of like-minded folk well beyond the Austria-sized service area of my local site. Since 2003, the NWP Annual Meeting has been my only consistent professional pilgrimage. I remember the first meeting I attended in Sa n Francisco, where I marveled at the seemingly endless parade of people that Tom Fox knew from all over the US (and, often, beyond), while I knew only a handful. The scope of the network was actually boggling to me; while I knew of the network conceptually, its manifestation in the form of real people who knew, liked, and respected each other was a revelation. In the intervening years, I’ve had too many opportunities to list to work with smart Writing Project people from across the US, so that now, going to the Annual Meeting each year feels like a reunion where we all have the chance to talk, laugh, connect, and learn together. What I think is striking about my story here, which might be dismissed as just so much solipsism, is that it seems to capture a ubiquity within the NWP network. Most of us enter the Writing Project without knowing much about it, and then stick around because it does something for us as educators that no other organization seems able to do: allow us to chart our own paths to professional fulfi llment, while connecting us to people, ideas, resources, and opportunities that we would never have found if we had simply decided to do our good work in isolation behind a closed classroom door. On this, the 40th Anniversary of the first Summer Institute at Berkeley, I’m grateful to the vision of Jim Gray, who first believed that putting smart teachers in a room together would yield great things. Few educational endeavors can claim such longevity, and I’m grateful each day for the connections his legacy has enabled me, and thousands of other TCs like me, to make. While I’d love for this to be a deep, profound reflection on the learning that happened at the 2014 Digital Media and Learning Conference, I think the reality is more that this will be a brief cataloging of resources I picked up that I don’t want to forget. Such is the effect of exhaustion and overwork. A couple of themes ran through the conference, but the most prominent was the presence of Connected Learning principles. In a nutshell, the Connected Learning principles are: interest-driven learning, peer supported learning, academic-oriented teaching, production-centered classrooms, openly-networked teaching and learning, and shared purposes among teachers and learners. First, a couple of thank-yous are owed. Jayne Marlink, the Executive Director of the California Writing Project, invited to me to attend the conference and covered most of my travel costs; without her help, I wouldn’t have been able to attend. I’m grateful. I also want to publicly thank my colleagues from around the National Writing Project who put up with my company over the course of the conference: local Writing Project site folks Kim Douillard, Joe Dillon, Mia Zamora, Anna Smith, Kevin Hodgson, and Paul Allison, and NWP staffers Christina Cantrill, Paul Oh, and Elyse Eidman-Aadahl. It was so rewarding to have so many people to think with as we HOMAGOed (HOMAGO = hang out, mess around, & geek out). Teaching in the Connected Learning Classroom: The Digital Media + Learning Research Hub Report Series on Connected Learning, a smart, readable, provocative new eBook edited by Antero Garcia. Christina Cantrill and I ran a DML Cafe table session promoting the eBook and had some interesting conversations with participants about turning the eBook into a game. Twine (http://twinery.org): A choose-your-own-adventure text game creator. Taleblazer (http://taleblazer.org): A location-based, alternate-reality game creation platform. Hive Jumpstart Guide for Pop-Ups, Hack Jams, and Maker Events (here’s a short video of the pop-up event run by Steam Studio in summer 2013 that helped inspire/develop the guide). MIT Media Lab’s Lifelong Kindergarten Projects are amazing. Particularly interesting is the Build in Progress project, which provides a way to document the making process (including branches that prove to be unsuccessful). Designing an Ecosystem for Digital Badges: handout from session on digital badges. There was much more than this, but as I said before, this post is mostly a selfish attempt to help me remember a few key resources that are likely to play into professional development work later this spring and summer with the Northern California Writing Project. I’m writing this on the eve of our first of four Saturday sessions that comprise the Northern California Writing Project‘s Common Core Tech Camp. The participants have been part of a group working since 201, the Content Area Literacy Network project, a California Department of Education-funded grant program whose aim is to jump-start the Common Core Literacy Standards in science, social science, and technical subjects. The work of the teachers involved has been really exemplary–and it needs to be more visible. Hence the Tech Camp. Our purpose is to take this work from the participants’ classrooms and go public with it online. To that end, we’ll be using a number of different tools. In keeping with the NCWP’s commitment to the mission of Mozilla’s Webmaker program and tools, we will create webpages using Thimble that will serve as the central home for the resources. We’ll be using mobile computing devices to make movies and whiteboard presentations to embed in the webpages. We’ll play with graphics and infographics as well, starting with simple tools like Wordle and Easel.ly. We will use Popcorn to remix media, and learn about (and earn!) Open Badges (which we’ll store in our Mozilla Backpacks). Sounds exciting, doesn’t it? Wish us luck! I’ve enrolled in the P2PU Make/Hack/Play Together course, offered by the talented Karen Fasimpaur (she hand-built her own off-the-grid house in the Arizona desert!). Our task this week was to make something in the real world. Of the many suggestions on offer, one seemed particularly appealing to me: a toy hack. I especially liked the idea of creating a visual pun. This is a set of replica darts that are nearly impossible to throw well, but they’re pretty cool looking. Here’s the first make. Supplies: old legos, index cards, and sharpies. Can you guess the pun I was going for? My second make. Supplies: sculpey. I’m no sculptor, but I hope you can get at what I was thinking. Third make. I don’t know why this image won’t rotate for me. Tried editing it on my computer, on my phone, and in WordPress. I’m flummoxed. Supplies: index cards and sharpies. Probably a tough one unless you play video games. 🙂 Oh, ignore the tardis as it has no relation to the make (it’s just the USB hub that sits on my desk at home). This project reminded me of how much fun it is to make things with my hands and to take a shot at simply being creative. I enjoyed spending a couple hours on a Saturday making these little projects. Oh, and if you’re looking for answers: Make 1: Dodge Dart. Make 2: Dart Frog. Make 3: Dart Feld (from Legend of Dragoon). TL:DR version: Mozfest was a crazy, cool conference that challenged my ideas of what professional learning can look like. Amazing, right? 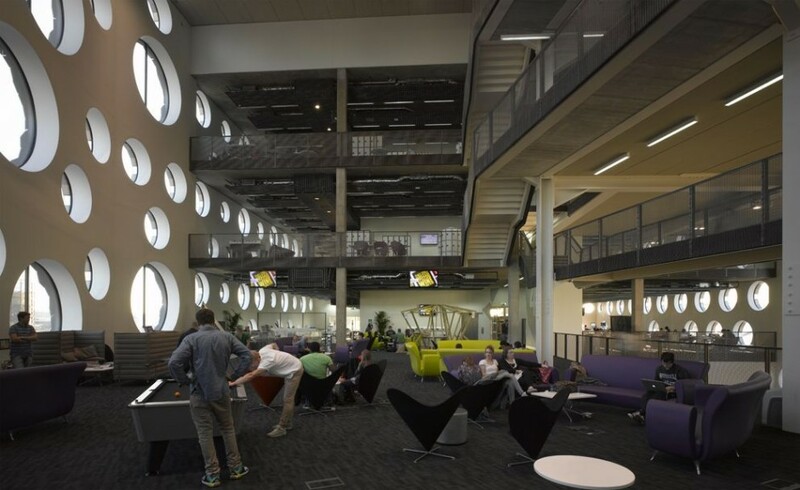 Nine floors, all with open floor plans for making, learning, sharing, and teaching each other. I spent most of the time on the sixth floor, where we were working the Teach the Web/Build the Web strands (facilitated by the remarkably smart and energetic duo of Laura Hilliger and Kat Braybrooke), but I was pretty intrigued by the Open Badges work on the seventh floor and the Make the Web Physical group on floor two. I would have needed seven or eight clones to have even a chance at glimpsing all that was on offer. Before the conference began, I worked with Christina Cantrill and Paul Oh from the National Writing Project, along with Stephanie West-Pucket from the Tar River Writing Project at Eastern Carolina University, to propose and plan for sessions and scrums; Elyse Eidman-Aadahl and Chad Sansing joined us at the festival. The session I ran was nominally on intersections of remix and coding, using illustrations from comic books to to code the emotional content of stories people told about how they got to Mozfest. I say nominally because the intent and plan isn’t quite the way it worked out. I don’t think the session went badly, as far as it went; however, I don’t think it ended up being a great fit for Mozfest. The results produced were interesting and led us into a good conversation about ways to support student writing, but there seemed to be less energy than I’d hoped involved in the endeavor. Of course, it was also at the end of the day on Sunday, and if everyone else was as tired as I was, that could be a contributing factor. The make I led as part of the Digital Storytelling scrum was more successful. In case you’re reading this and wondering what a scrum is, read the Scrumfest etherpad. The task was to create a set of annotated videos of digital stories that could be used as a teaching resource for anyone interested in making a digital story. At the Saturday morning lightning talk (a 1-minute description of the task given to all the people in the Teach/Make the Web group), I got some good responses from people who work with digital storytelling. Philo Van Kemanade of Popathon appreciated that I identified as a problem the fact that many first attempts at digital storytelling aren’t all that great, and liked that my make was trying to address this issue. Tom Wills and I had a great conversation about his work with NovaraMedia and ways of helping newbies learn to craft effective journalistic reports. Chad Sansing added a load of possible videos for annotating to the scrum’s etherpad, and Khin Tye learned how to annotate videos using Popcorn and created an annotated version of “Unlocking the Truth.” While the remaining tasks in the make were left incomplete, I’d say that the great conversations and connections made this a success. While my session and the scrumming kept me mostly on the sixth floor–which, frankly, is where the coolest people were, anyway 🙂 –I did have a chance to sneak down to the second floor and attend Ricarose Roque‘s super-cool session on combining Scratch and puppets wired up with Makey Makeys. Both of these were things I’d wanted to learn more about for ages, so I was psyched to get the chance to learn about them through playing and making. What was even cooler was that one of the other participants in the session, Marc Grossman, found me later in the afternoon and gave me a great tutorial on Scratch; having taught it in after-school programs for the past 5 years, he was a patient and thorough teacher and I am definitely in his debt! Steph and I also had the chance to attend part of a session Doug Belshaw led focused on badges and the new Mozilla Web Literacy Standard. I think Steph and I were both hung up on the use of the word “literacy,” as the way the standard represents web literacy is strictly skills-based; we are both accustomed to thinking of literacies as more complex than a set of skills. An understanding of literacy as an “identity toolkit” (to use James Paul Gee’s term) never isolates “skills,” but instead situates them within social contexts. We only had a few minutes to ask Doug about this, but he reported that a white paper he’d written would be forthcoming that explained why these “meta aspects” (as he named them) ended up being removed from the final version of the standard. I look forward to reading it. One of my regrets is not having the chance to hang around the badging people more, but at least I had the chance to earn some badges. Jeannie Crowley from Bank Street created a set of badges for each of the scrumfest’s make strands, and I earned ones for Low Fi, Remix, and Digital Storytelling. So that made me happy. I feel a little like this post is a disjointed jumble (unlike Chad’s coherent reflection on his take-aways from Mozfest), but I think that’s because Mozfest was so unlike any other conference (or, indeed, any schooling/learning experience) I’ve been lucky enough to attend. It challenges so many assumptions about professional learning that I’m still trying to process it and turn it into ways that the Northern California Writing Project might use to expand our work with teachers and students in our service region. With time and experimentation, I hope to come to some more clarity. For now, I’m just grateful that I was able to be part of Mozfest. The Northern California Writing Project held two different Maker Day events this summer. The first, reported on here, had a Making with Technology focus; the second focused on making things with our hands. We were lucky to be able to meet at Kim Jaxon’s home, which features the perfect setting for a day of making. We used the large outbuilding, which is divided into a huge shop with all the tools and supplies we could have wanted, and the infamous Elwood’s Cyberpunk Saloon, featuring tons of cool and inspirational steampunk art created by Kim’s awesome spousal unit, Jeff. Don’t worry, the saloon just provided an awesome backdrop for our day–no offerings that might have impaired our abilities! 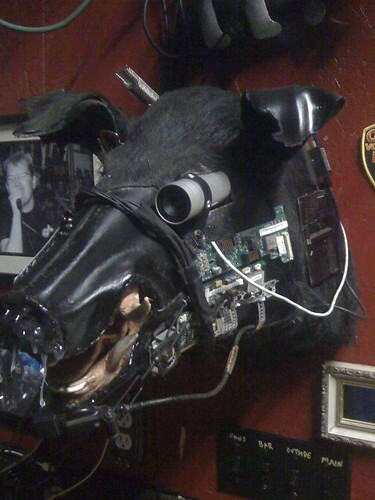 But being surrounded by things like the confessional boar, complete with working webcam, made us want to make cool things, too! We started out with a paper theme, first by making paper rockets and launching them using a compressed-air launcher (we built our own launchers later in the afternoon), then making basketball-sized decorative tissue-paper puffballs, and finishing with origami books. After a make-your-own sandwich (hey, it was a maker day, after all!) for lunch, we made LED blinkybugs (here’s a link to the instructable; for cheap LEDs and batteries, try one of the Hong Kong retailers like Deal eXtreme). Success again. The only real fail of the day came when we tried to make chain maille bracelets like the ones in this Kickstarter campaign. But without failure, we never grow. Or that’s the type of platitude my kind friends provided when my instructional skills in this arena proved futile. 🙂 I guess we should have had on hand a tutorial on weaving the Persian 3-in-1 pattern to help people out. We ended the day with the opportunity to remix all the makes, and finished with further rocket launches after the creation of four more brand-new launchers had entered the world. Such fun. Aren’t you sorry you missed it? What’s interesting, though, is how much cross-curricular thinking went into the whole making process. Making the rockets helped us think about dimensions, aerodynamics, air pressure; the puffballs led us to think about patterns and iterations; the books made us consider structures, organization, and measurement; the bugs let us see circuitry and switches; the chain maille — well, that showed us the value of failure and frustration, I guess. All of the projects, though, made us think aesthetically along with all of the other aspects. It seemed to really hit home the relationship between form, function, and beauty. The Northern California Writing Project held two different Maker Day events this summer. The first had a Making with Technology focus. Lou Buran (@ljangler) led participants in thinking through the reasons why kids (and adults!) need to know how to code, and then we had the opportunity to put our ideas to work as we played with Mozilla’s Thimble website. If you haven’t seen it before, Thimble lets a user write html and css in a pane on the left side of a browser window, while the rendered text appears in a pane on the right side. Hints and troubleshooting are built-ins, helping users identify trouble spots. We spent most of the day hacking away at html and css, figuring out how to do things with code to make our online texts look and behave the way we wanted. There were a few frustrated “arrghs,” but even more jubilant exclamations of “Yes!” It was a really fun, productive day. One of the biggest indicators of how engaged everyone was: even when the lunch of delicious Chipotle burritos arrived, I had to practically drag people away from their screens to eat! Week 3 of #teachtheweb is beginning, with the topic being “the open web.” The question is how we understand the mechanisms that allow the web to function, and why the transparency and openness of those mechanisms should matter to those of us who use, make, and teach the web. I’ve been thinking about this a bit lately due to some thought-provoking blog posts on the Chronicle of Higher Education‘s ProfHacker blog (see here and here and here). Blogger Konrad Lawson is exploring the idea of an open-access source/process/thingamajig that he relates to the ways software gets developed on GitHub, and I have to admit that a lot of the discussion went somewhat over my head as I don’t really think of myself as a coder. However, Lawson discusses the idea of “forking” a GitHub repository in a way that is quite similar to the ways that we’ve been thinking about remixing and hacking in the last couple of weeks. One of the coolest things last week was a link that Lou Buran pointed me to via a tweet, in which he praised two very active #teachtheweb folks: Chad Sansing and Kevin Hodgson. They were playing with Firefox’s “Inspect Element” tool, in particular the 3-D view feature. So I took a look at a 6-word story I had written as part of Week 2’s assignment, using the 3-D view to see all the layers that show up in Mozilla’s Thimble html-coding environment. What really struck me about this view was the way that it actually *did* make the underpinnings of the web–which we want to be so “open”–visible in their complexity. I was reminded of the way that Slavoj Žižek has described the difference between the Lacanian notions of the real and the symbolic; I used to equate this back in the good old days of dial-up internet access to the godawful screeching of the modem (the “real” of the internet) and the way it translated those horrible squeals into webpages and emails. It seems that the coding revealed in the 3-D view is similar in its ability to allow us to “see” the real elements that support our mediated experiences with the web. On our second full day of iPad inquiry, we’re going local. What’s up in the community of Chico that’s interesting enough to conduct an inquiry? Good question. These links may help us figure that out before we head out the door and do some digging ourselves. The Content Area Literacy Network (CALNet) Summer Institute took place June 18-21. We had a dynamic, engaged, and incredibly sharp group of teachers on hand from high schools in Alturas, Corning, Hamilton City, and Yreka. Lots of resources were shared; below is a sampling. Access the post-institute survey here.